Wholesale Photo ID Tags -Luggage Tags Personalized in Full Color. Guaranteed lowest cost in USA and Canada. High quality, yet inexpensive Photo ID Luggage Tags in bulk, customized with you full color logo on one side. Pre-Printed ID card on the opposite side. Free artwork design and Free proofs! American clients pay no taxes. OPTION: Buckle Strap: add $0.05 ea. PRODUCTION TIME: 5-7 days after art approval; Rush 3 day production: add $0.30 per photo luggage tag. Approximate Size: Height: 2 1/4" Width: 4"
Full Color Custom Imprint Four is Included on one side. Packaging: 250 units per carton of 16 lbs. OPTION: Buckle Strap: add $0.05 ea; Individual Polybag: add $0.05 each. 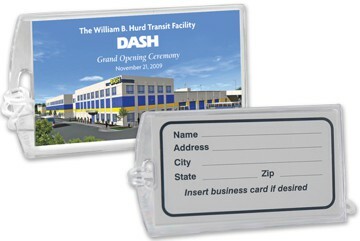 PRODUCTION TIME: 5-7 days after art approval; Rush 3 day production is available: add $0.30 per photo luggage tag.